Brush Research Manufacturing, a leading manufacturer of industrial brushes, provides you with end brushes for tight applications. Our miniature end brush is perfect for applications that require precision deburring and finishing in hard to reach or recessed areas. These end brushes are manufactured in straight steel, straight brass or natural filaments, so you're sure to find one that suits your needs. 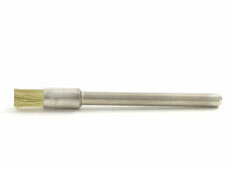 Contact a distributor today to learn more about our miniature end brushes.